NGO Soladirity Programme (Phase-IV) is funded by Bread for the world, Germany and implemented through Sansthagat Bikas Sanjal with its 15 member organizations (MOs). Through the project three major components namely livelihood, advocacy and organizational development issues are addressed. This three year's (2018 - 2021) project is funded by Felm-Nepal which is implemented by Jana JagaranSamaj (JJS) and Welfare Association for Children Tikapur (WACT) through the coordination of Sansthagat Bikas Sanjal with the aim to create a peaceful and just society through exchange and cooperation among people of diverse culture and ethnicities, CPSD has focused on building a relationship and attitude change. This three years project is financially supported by MCC-Nepal and implemented by Community Development Society, Ramechhap through coordination with Sansthagat Bikas Sanjal to support building disaster resilient communities by contributing to understanding of earthquake resilient buildings and improving sustainable livelihoods through strengthening capacities of communities and local institutions. 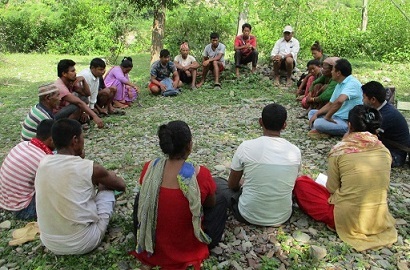 The project plans to rehabilitate and increase the resilience of 6 Mahji communities in 3 earthquake-affected VDCs and 1 municipality in Ramechhap District. The rehabilitation project involves capacity building on earthquake-resilient shelter construction and support for livelihood strengthening. This two years (2018-2019) project is financially supported by WWDP-German Committee and is being implemented by Grameen Mahila Jagaran Sanjal (GMJS), Okhaldhungaand Youth in Empowerment Sector-Nepal (YES-Nepal), Achham through the coordination of Sansthagat Bikas Sanjal with the aim of promoting sexual and reproductive health and rights of women and adolescent girls. The project has envisaged three key strategies namely Awareness on Reproductive Health, Advocacy for the rights of women and adolescents, Increase women's income and access to health services to effectively execute the project. Project Coverage: Molung Rural Municipality, Okhaldhunga and Mellekh Rural Municipality, Achham. Youth Leadership for Development is youth centered action reflection training with the aim of creating an environment of sharing knowledge, skills and emotional intelligence among the youths of different communities in order to contribute to peace and community development through youth leadership.